Bratislava, May 13 (TASR) – It would be good to end the EU’s evaluation process into Greece’s reforms as soon as possible, with the prospect of releasing further aid for Greece, Slovak Foreign and European Affairs Minister Miroslav Lajcak said after meeting his Greek counterpart Nikos Kotzias in Bratislava on Friday. „We’re ready to talk about relieving the debt burden, if Greece continues meeting all the agreed conditions,“ said Lajcak. 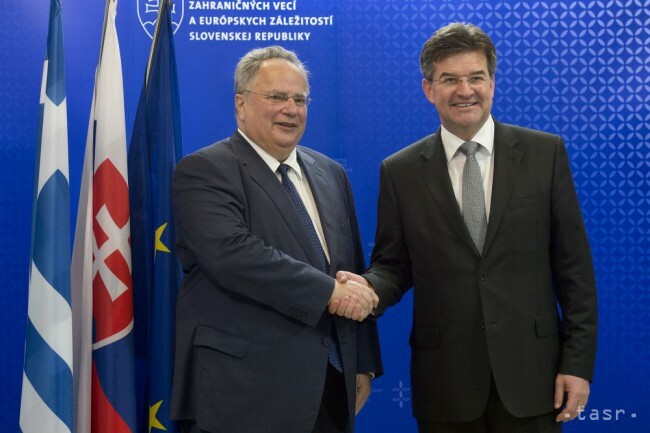 Lajcak described the fact that the Greek minister accepted the invitation to come to Slovakia as a display of restored trust and a high level of understanding between the two countries. „We share strong support for the European project, while the statehood of our countries leans on strong anti-fascist traditions. Our relations are traditionally carried out in a friendly, transparent and constructive atmosphere,“ said Lajcak at a press conference. „There are clearly more things that connect us than things where our opinions diverge,“ said Lajcak, adding that the two ministers have agreed to meet annually, at least. „It’s obvious that many of the issues that are viewed as priorities by us are also important for Greece – for example, youth unemployment, strengthening of the internal market and energy. Of course, we also talked about migration. The migration crisis concerns the entire EU, it isn’t only Greece’s and Italy’s problem. We appreciate Greece’s efforts to master the migration flow. There’s still a lot of work ahead, but the current situation allows us to share a certain level of optimism,“ said Lajcak. Kotzias stated that he agreed with Lajcak on issues concerning the Mediterranean, support for joint solutions of the Cypriot issue and EU enlargement in the Western Balkans. Meanwhile, the Greek Government fully supports Slovakia’s agenda in the EU Council during its presidency in the latter half of 2016. According to the Greek minister, the migration agreement with Turkey appears to be functioning so far, as the number of migrants coming to Greek islands has fallen from 3,000-4,000 to some 100 daily. Kotzias said that the migration crisis has its origin in wars in the Middle East. „Neither Slovakia, nor Greece have caused the wars in the Middle East – we’ve only been paying for them,“ he added.